If you are looking for a self catering holiday in North Wales, this is an ideal holiday cottage to rent from which to explore Betws-y-Coed, the Snowdonia National Park, and the rest of North Wales. This is an end of terrace cottage. Downstairs there is a spacious lounge/dining area with electric woodburner-effect stove, and patio doors leading to a paved area with forest views that is ideal for morning coffee or an evening drink. 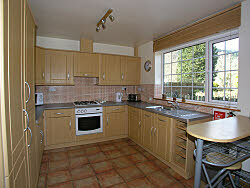 There is a well equipped fitted kitchen with breakfast bar, and a utility room plus extra WC. Upstairs there are 3 bedrooms (1 double, 1 twin and 1 single) and a bathroom. The newly installed bathroom has a bath with shower over, basin and WC. 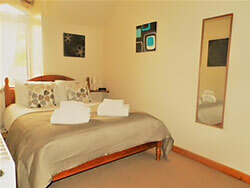 This self catering accommodation has parking for 2/3 cars, and a separate lawned area a few yards from the cottage. "Thank you Alwen. 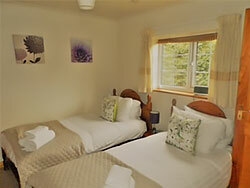 Our last minute booking turned out to be one of the most enjoyable and relaxing breaks we have ever had, not least because of your beautiful, comfortable cottage. We look forward to a return visit. What a find!!" - A & Y, Shropshire. 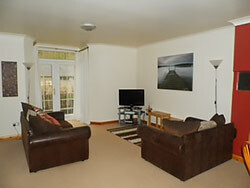 This holiday rental is an ideal base from which to explore Snowdonia and the rest of North Wales. Find out more about our location including things to do in and around Betws-y-Coed. 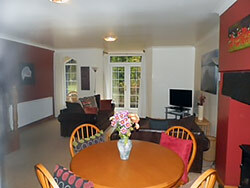 Content is copyright 1 Railway Cottages Self Catering Holiday Cottage, Betws-y-Coed, Snowdonia, North Wales UK.